Everywhere you look, Pinterest has been unavoidable, with its insane rates of growth, and clones popping up left and right in an attempt to get in on the online pinboard action. Mistash is a new California-based site which is, in some ways, similar to Pinterest but has enough of an interesting twist to set it apart from other Pinterest-like sites. 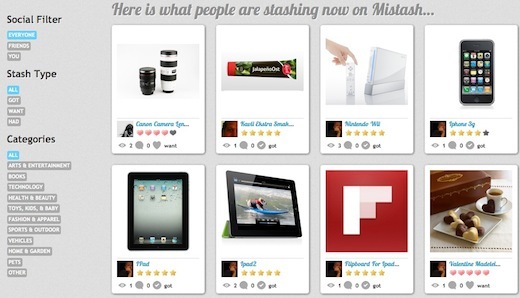 In a nutshell, Mistash is a social catalog of products. As you make your way around the web, a handy Mistash bookmarklet lets you save products you’ve got, want or had. With the actual way that Mistash works, the comparison to Pinterest is unavoidable. However, Mistash’s focus is far more narrow – aiming only to be a place for users to save their favourite products – whether they had them, have them or want them. To use Mistash you will have to log in with either your Facebook or Twitter account, with no option to sign up independently of these two sites. You can then begin to ‘stash’ products from all over the web, or upload images of the product from your computer. You can then choose the list the product goes under, give it a rating, and add a description. Mistash automatically adds tags for you, although there is currently no way to edit them, and they’re not always accurate. The current categories on Mistash include Books, Technology, Vehicles and Pets among others, but users have already started to get creative with their ‘stashes’. Some users have saved their favourite apps, for instance, alongside the many gadgets, games, cars, and clothes already saved on the social site. Of course it wouldn’t be a social network if you couldn’t follow other users. User profiles show who you follow and who follows you and your activity feed, while social interaction on the site also includes the ability to comment, like and add other users’ products to your stash. So the big question is, why use Mistash? For starters, among friends, it’s a great way to keep track of each others wishlists. If your friends have birthdays coming up, what could be easier than getting them on Mistash and encouraging them to create a wishlist of the latest products they want? By keeping track of their ‘Gots’ you can also be sure not to buy them something they already have. Even if your personal friends aren’t fans of Mistash, you can still get quite a lot out of the site. Following other users who like the same stuff as you turns Mistash into an interesting product-discovery tool. As more people begin to use the site, it also has the potential to become a great tool for finding out what the most popular products are and which products people crave the most. On a personal level, it becomes a great way to keep track of products you want to buy, books you want to read, and so forth. Once you’ve got the coveted gadget, book or product in your hands, you can head right to Mistash, and savour the satisfaction in clicking the ‘Got it’ button on your profile. Depending on the product categories, you can get pretty creative with how you use the site. Have you used Mistash? Let us know what you think of it in the comments.